We were all shaken by the tragedy of the illegal migrant boat capsized off the Egyptian coast last month. It is arguably one of the worst tragedies this year, with a death toll reaching more than two hundreds human being who lost their lives for the illusion of a deceptively better opportunity across the other side of the Mediterranean. The incident stirred a torrent of thoughts and emotions, underlying the gravity and complexity of illegal migration, as a multidimensional phenomenon that inflicts high socio-economic and humanitarian cost on all; origin, transit and destination countries alike. Egypt was one of the first countries to recognize the heavy implications of this multifaceted problem and the need to inject a greater sense of urgency to curtail it. The government is mindful of the obligations incumbent upon it in this regards. 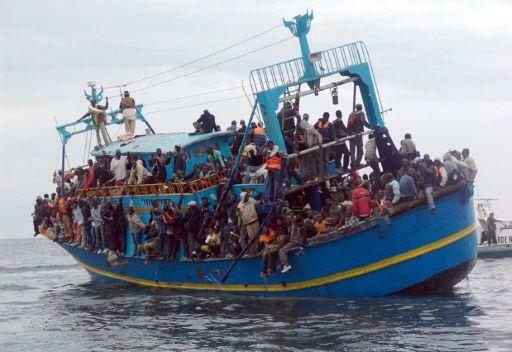 The rising tide of illegal migration will not sway us in our determination to take all preventive measures at all levels to halt the loss of lives of Egyptian citizens and fellow Africans targeted by abusive smugglers. Our unequivocal commitment to this cause is deeply rooted in a strong belief of the need to adopt a comprehensive approach to tackle the problem at its core. To this end, it was vital to create a new Egyptian body to set the state’s policy and overcome any bureaucratic constraints on our ability to respond to the mounting challenges brought by illegal migration. The Prime Minister promulgated, in March 2014, a decree to establish the Egyptian National Coordinating Committee on Combating and Preventing Illegal Migration (NCCPIM), as an inter-ministerial entity bringing together 19 relevant ministries and Human Rights national agencies, with an institutional structure and a clear mandate to champion and coordinate national efforts, and to lay the legal and operational foundations upon which such efforts will be premised. The NCCPIM discovered from the onset the growing need to introduce a new national legislation that clearly defines the crime of migrant smuggling and provides law enforcement agencies with necessary legal tools to tackle head on organized criminal networks of smugglers and bring them to justice as they operated in impunity trading the fate and aspirations of our young generations for profit. The NCCPIM worked at stretch on a ground-breaking comprehensive law, named “combating illegal migration and smuggling of migrants”. It was drafted in cooperation with all relevant national stakeholders in compliance with Egypt’s international obligations, primarily Palermo Protocol 2 and the convention of the rights of the child (UNCRC), and in conformity with internationally recognized HR principles and norms. The draft law was presented for societal dialogue and finally approved by the Egyptian cabinet in November 2015. It was recently adopted in principle by the parliament to constitute, along with the Anti-trafficking law issued in 2010, the legal cornerstone of our national response to the phenomena of illegal migration. It will also be a pioneering legal instrument that can be replicated in other MENA countries. In parallel with the required structural changes in the legal framework, operational response was also tackled. The first step was to develop a statistical map of the Egyptian governorates with the highest rate of people vulnerable to the risk of illegal migration. Such information would place the NCCPIM in a better position to carry out its duties in curtailing the flow of illegal migrants, and targeting both communities at risk and smugglers. To achieve this purpose, the Committee finalized two field studies on the youth and unaccompanied children under the age of 18. They identified the different forms of illegal migration, the driving factors and the demographic characteristics of the Egyptian youth and children migrating illegally. The studies provided researchers and decisions makers alike with the basis for informed analysis and targeted interventions and led the way to the nurturing of a comprehensive solution to the scourge of illegal migration. Our efforts culminated in the development of the first national strategy (2016-2026) to be launched soon. It is a decade-long road map that was agreed upon by all national stakeholders and integrates all economic, societal, political and cultural dimensions of the problem, thus providing solid foundation for a multi-dimensional response to the phenomenon. Under the strategy, a two-year action plan (2016-2018) was developed with implementation and review mechanisms based on verifiable key performance indicators. Raising public awareness remains at the center of our strategy. We have prepared a study on the main components of a communication campaign, in cooperation with the International Organization for Migration. The committee is engaging with the local and international media to shed more lights on the negative impacts of illegal migration and the positive economic alternatives in Egypt. We are building our strategy on a proactive basis, reaching out to the youth and conducting numerous field visits to at-risk communities across the Egyptian governorates to inform and explain the life threatening dangers illegal migrants will be exposed to as they put their fate in the hands of the criminal gangs of smugglers. Our message to the youth is clear: it is not worth sacrificing you life and dignity for a false promise. It is not worth losing hope, Egypt is your future. One would argue that there is no single root cause behind migration. There are complex and overlapping motivations creating the phenomenon. However, the socio-economic factors are undeniably key drivers of illegal migration. It is imperative to attach the greatest importance to addressing the developmental aspect of the problem. Our efforts will not bear the desired fruits if not accompanied with a wide array of socio-economic projects that can channel the ambitions and goals of our young generations away from the deadly journey across the Mediterranean. Improving the quality of education is an important pillar in our quest to enable a thriving environment for Egypt’s youth to stay in their country. We place a major emphasis on technical education as a critical field that can generates enormous job opportunities. We also work on creating partnership with micro, small and medium enterprise development agencies in Egypt to highlight the jobs available for the youth in a sector that has been an engine for growth and job creation in numerous other countries and that bears a real potential for Egyptians. We believe that the main competence of our nation is its growing human capital. Despite the economic hardships Egypt is going through, the government is taking all necessary steps to provide the young generation with new outlets to prosper and innovate. Empowering existing safety nets, creating new job opportunities and spreading a message of hope are the first steps in a long road in the fight against illegal migration in Egypt. It is worth noting that the recent growing scale of illegal migration comes against the backdrop of a turbulent political and security situation in the Middle East. The region is coming under increasing strain with demographic spillover effects, not only for Europe but also for countries south of the Mediterranean. Egypt is one of these countries bearing the financial brunt of generously opening its doors to millions of refugees and migrants. Unlike the situation in other countries, they are not placed in separated camps. They are an integral part of our society, sharing every aspect of life and receiving all essential societal amenities the government provides to their fellow Egyptian Nationals. Egypt is also a transit point for illegal migration operations coming from Africa, exerting additional pressure on the country’s limited resources. The recently endorsed law addresses the challenges Egypt faces, not only as a country of origin, but also as a destination country. It provides all kind of assistance to migrants who wish to return voluntarily to their countries, in full respect of their human rights. A special fund will be launched under the law, to confer needed protection on both migrants and witnesses who report on any smuggling crime. International support might not be enough to help ease the burden several countries bear to accommodate the growing number of migrants. We stand ready to enhance our engagement with international donors and financial institutions to mobilize additional resources for developmental projects with immediate bearing on youth susceptible to illegal migration in Egypt and elsewhere. The NCCPIM places the highest priority on enhancing regional cooperation, in particular with our African neighbours. The committee is working closely with the Egyptian Ministry of Foreign Affairs on providing capacity building and training programs to African diplomats and officials in the field of administration of justice. We believe that the NCCPIM serves as an exemplary institutional model that can be replicated across the continent. We stand ready to share our experience and best practices in this regard. Egypt is also a key interlocutor party within the context of “Khartoum process” between the African Union and the European Union, which aims to establish a continuous dialogue on illegal migration among origin, transit and destination countries. We should be under no illusions that security measures alone can suffice to tackle the structural challenges of illegal migration. The problem runs much deeper than the question of border controls. The rising sense of protectionism among some countries in the west is not the right answer. Adopting tough lines on migration will spell even more troubles and challenges. If we are to stem the tide of illegal migration, we have to share the responsibility, work together and collectively forge a solid partnership to promote sustainable solutions to the problem with a clear socio-economic focus and an eye on its humanitarian implications. It is not an easy task and will never be. We must take the hard road against all odds and purse our path to its conclusion. Egypt will continue to undertake its responsibility, and we will play our part in the regional and international efforts against illegal migration for the sake of our people and the safety and well being of human beings all around the world. Our vision is strongly rooted in reality and our political will and determination will enable us to overcome this challenge.